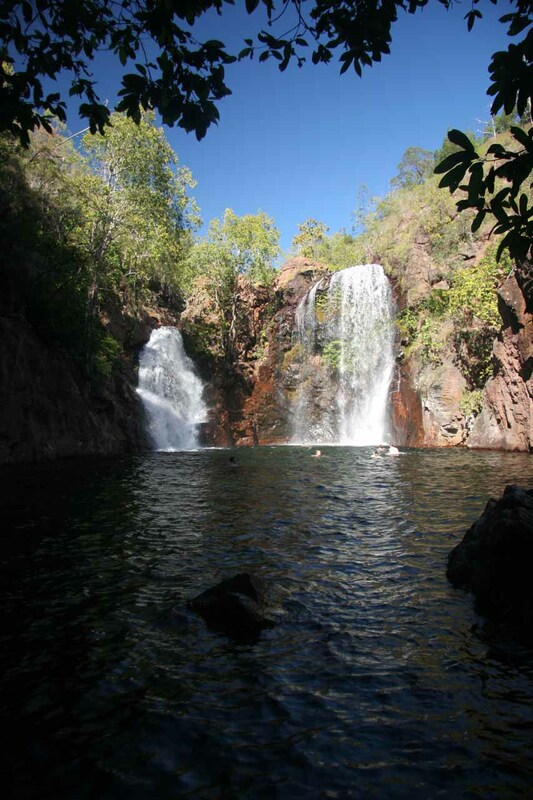 Florence Falls was probably our favorite waterfall in Litchfield National Park. 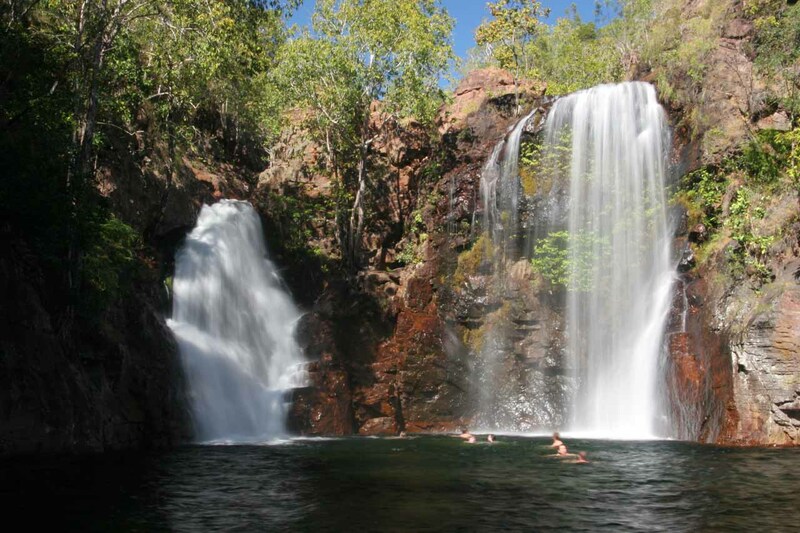 What made this waterfall stand out to Julie and I was its multi-tiered multi-segmented shape with a crocodile-free swimming hole that was perfect for lingering about and cooling off. 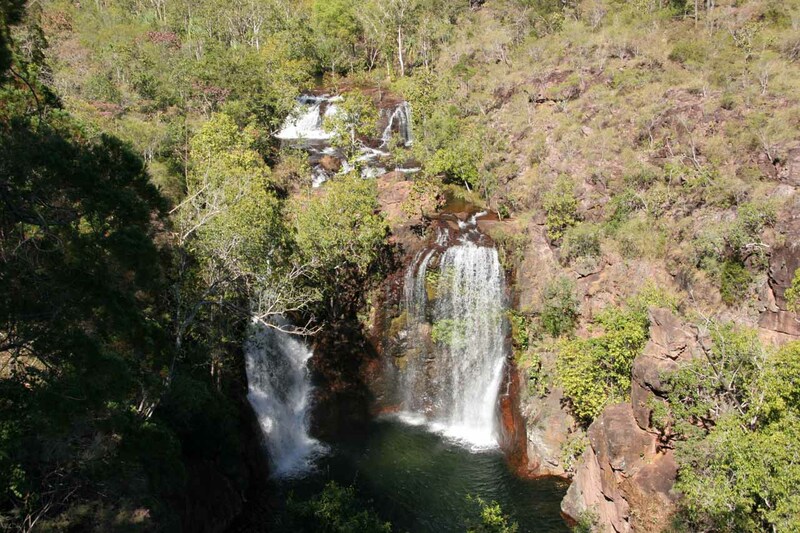 In addition to its characteristics, we were able to enjoy the view of the falls from an overlook near its top as well as from its cool and shady base. We weren’t alone in our sentiments towards the falls because it was very popular as many other people were sharing the experience with us during our visit. Florence Creek was said to tumble possibly 30-40m in total (though admittedly, I’m just guessing here). The main drops were said to be about 20-25m tall. The creek was rare in that it was said to be year-round so the falls themselves were also permanent. According to the signs here, this was possible because the porous rocks of the tabletop plateaus here absorb Wet Season rains, then they percolate as springs during the Dry Season. Plus, Florence Creek was isolated enough that there wasn’t as much of a threat of saltwater and freshwater crocodiles. 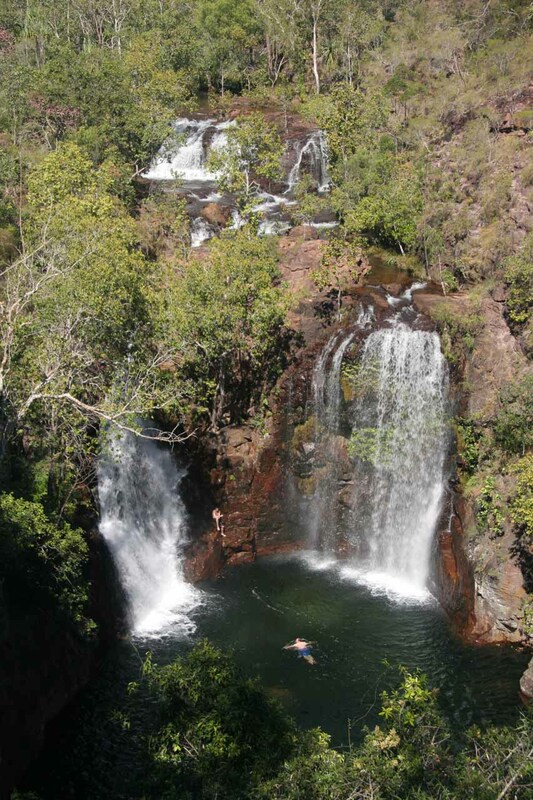 That’s why you see people swimming around the falls in the photos on this page whereas none of our photos for other waterfalls in Litchfield National Park had people swimming around them. Our visit began with a short walk from the car park (see directions below) to a wheelchair-accessible overlook of the entire context of the falls and gorge (see photo at the top of this page). 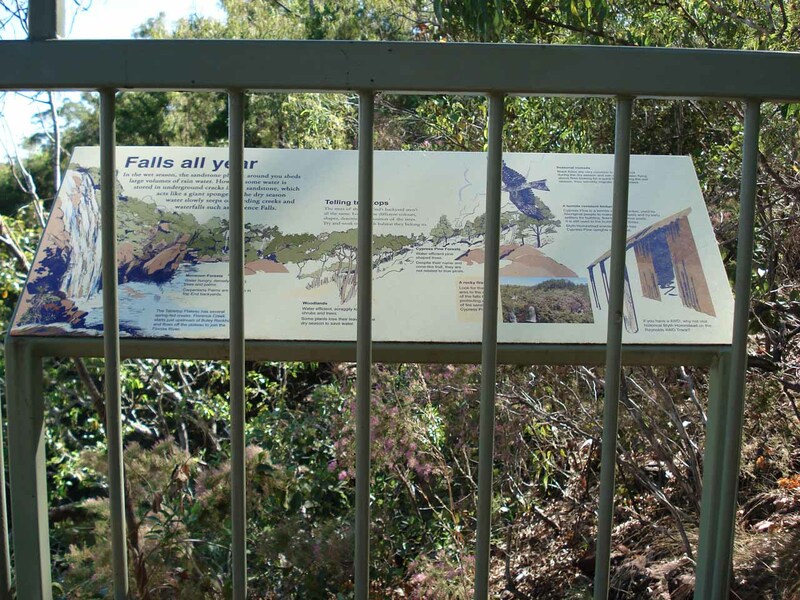 There was an interpretive sign informing us of how the falls was year-round as well as some of the wildlife to be found here. 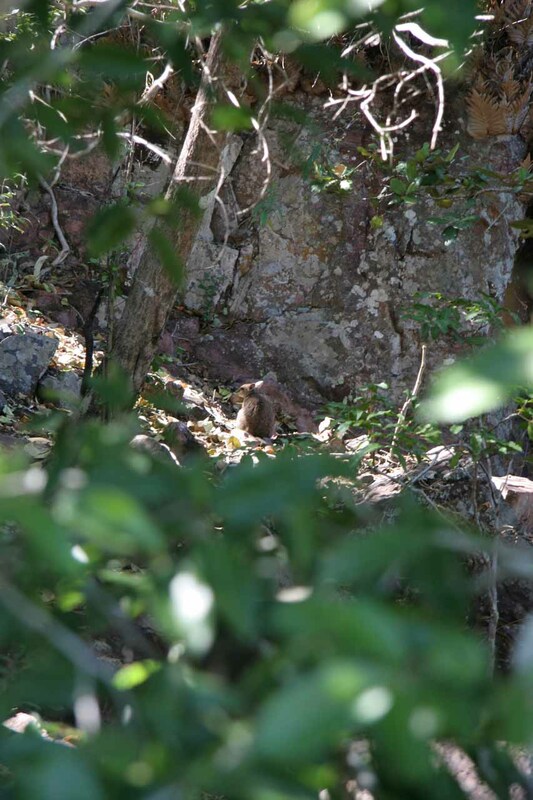 Then, we walked down a series of stairs hugging the tabletop plateau and going into the shady depths of the gorge. I recalled that it didn’t take long for us to make it to the bottom where we were right besides Florence Creek. 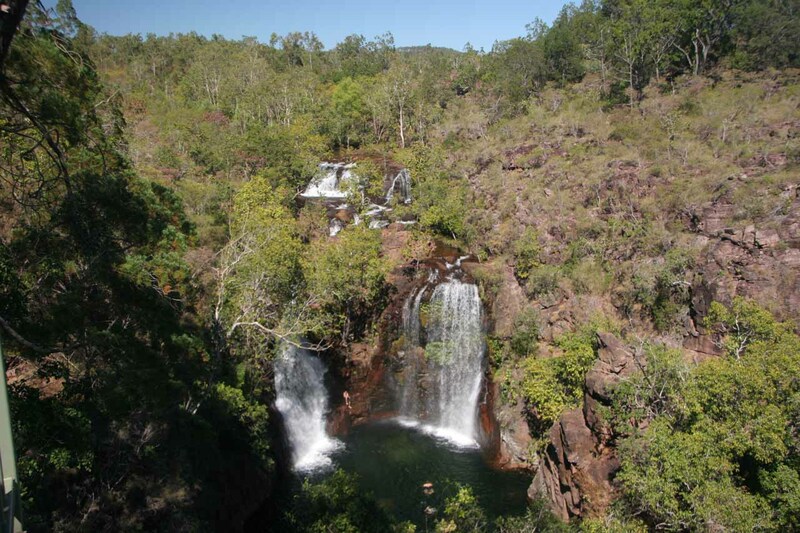 From there, we scrambled a short distance over rocks (keeping our feet dry) towards a frontal view of Florence Falls (which is shown in one of the photos below). We very easily could’ve joined the dozens of other people cooling off from the tropical heat and going for a swim. But Julie and I were merely content to just gaze at the falls and bask in the beauty of this place. When we had our fill of the falls, it was all uphill on the stairs, and the total amount of time we spent away from the car was a little less than an hour, including all the hiking and picture taking. 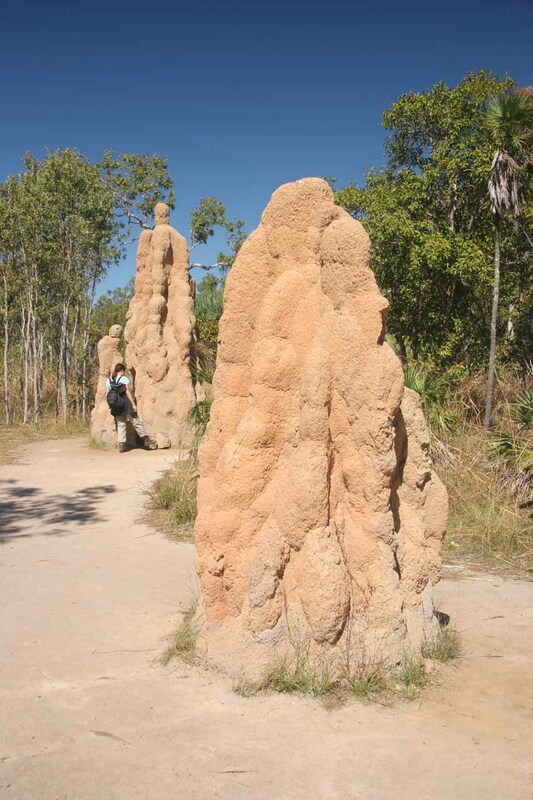 A short drive east of Florence Falls was the intriguing Termite Mounds. That attraction was well signposted. 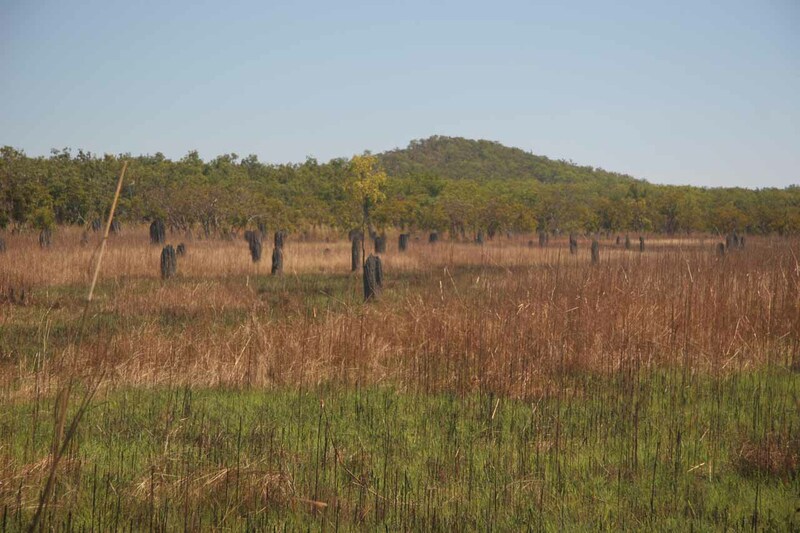 Now we had witnessed several termite mounds throughout much of Northern Australia, but for some reason, there was a very high concentration of them at this one spot. 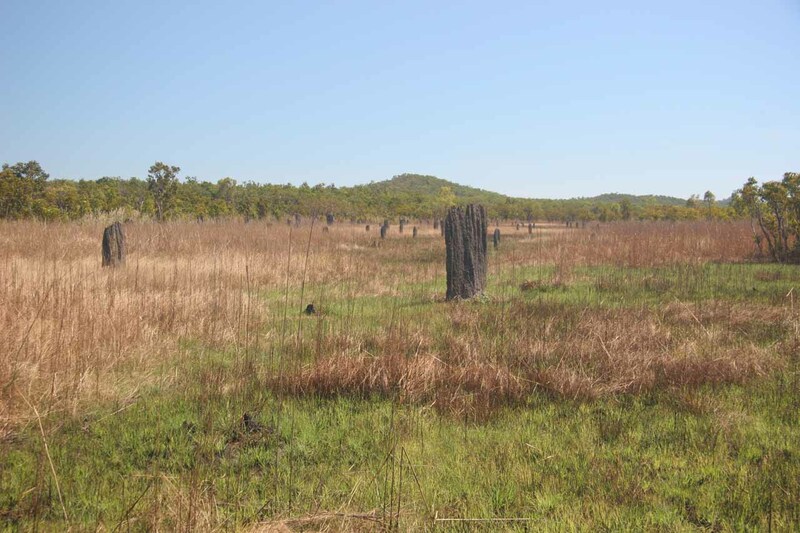 Plus, some of the individual mounds were so big that they were easily three or four times taller than us. Florence Falls resides in Litchfield National Park. 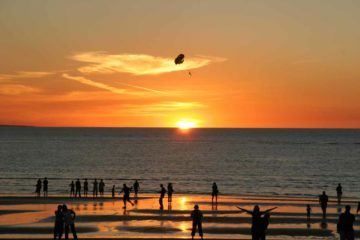 It is administered by the Northern Territory Government. For information or inquiries about the area as well as current conditions, visit their website. The turnoff to the car park is well-signed and on the north side (i.e. to the right as we were facing west) of the Litchfield Park Road (Hwy 30) some 41km (roughly 45 minutes drive) west of Batchelor and Rum Jungle. 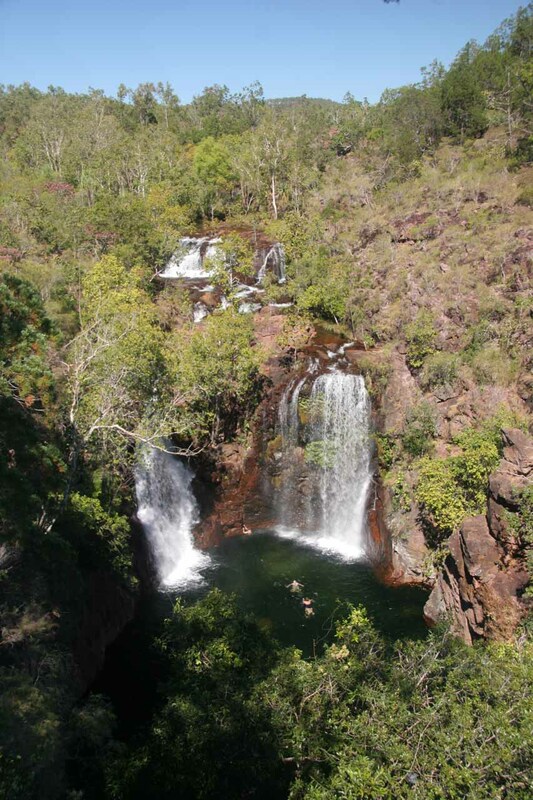 It sits just beyond the Buley Rockhole, which has its own series of pools and falls. For context, Batchelor was 97km (over an hour drive) south of Darwin.